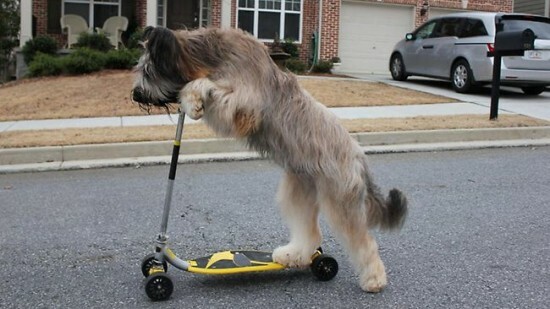 Norman, a 20-months-old Briard, has become quite the online star, after his owners posted videos of him riding a scooter. The incredible canine who lives with the Cobb family, in Canton, Georgia, started playing with a razor scooter in the backyard, when he was a pup. Karen Cobb says they saw him playing around with it and decided to give him a ride on it. He seemed to like it, so they tried to teach him to push it on his own. Now, Norman loves riding his favorite toy as often as he can. Norman is a very clever dog; he got his Companion Dog Title when he was just 15 months old, and is a regular at canine obedience competitions. In fact, the French Briard breed is known for talents like search and rescue, police work, guarding and herding. Throughout history, they’ve been loyal companions to important figures like Napoleon Bonaparte or Thomas Jefferson. 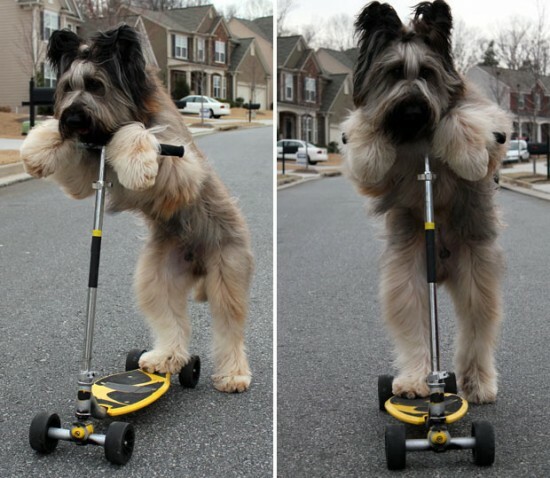 After the Cobbs posted videos of him riding around on a scooter, Norman quickly became an Internet sensation and is now one of the most popular friends on Facebook and has made an appearance on Stupid Pet Tricks on The Late Show with David Letterman.